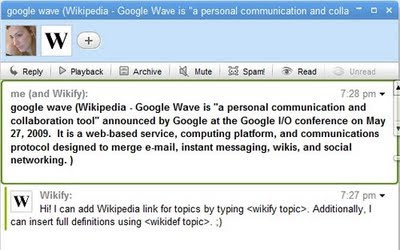 Como algunos ya saben yo ya tengo Google Wave, pero como casi todos es dificil ver todo su pontencial si no tienes muchas personas conectadas, asi que no qeuda otra que divertirse con las aplicaciones que hay, y gracias a este articulo Ultimate List of Google Wave Gadgets and Tools aca hay algunas herramientas y gadgets utiles. TwilioBot (twiliobot@appspot.com) automatically transforms the phone numbers in the wave into click-to-call links. If user clicks a link, a call is placed to his cell phone or landline and to the phone number in the link and the two are connected. The phone call can be transcribed and automatically inserted into the wave as text with a link to the audio of the conversation. 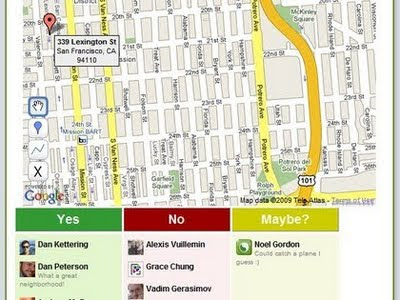 Lets users edit a map together, adding markers and polys with titles and descriptions. Users can also search for addresses and businesses and add those. Add bitly-bot@appspot.com to your contact list and then add this user whenever you want to shorten URLs inside Waves. It will do that automatically. You can also use the same Wave just to shorten the URL whenever needed. Grauniady is a Guardian Google Wave Prototype Robot and I really like this experimental gadget. Add grauniady@appspot.com to your contact list and input the phrase you want to search on The Guardian. This robot is a great example how mainstream media could use Google Wave. Remember Eliza, the auto-chat bot? She makes her way into Google wave as well. 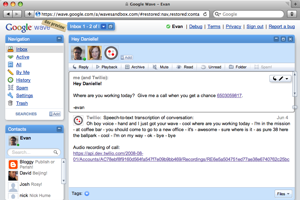 Add elizarobot@appspot.com to your contact list and talk to her if you are feeling alone in your Google Wave client. Nokar is pretty similar to Starify and works on the same command concept. 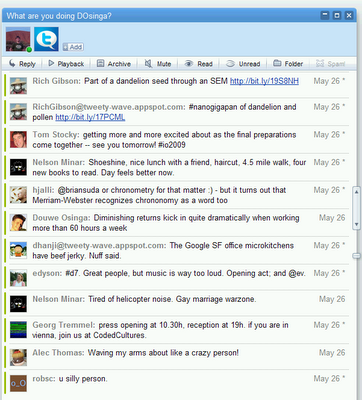 It allows you to do all sort of things such as: Convert your text to pirate-speak, show recent tweets by user, and more. Add lab2market@appspot.com to your contact list. Bloggy publishes the content of waves to a blog site. Add blog-wave@appspot.com to your contact list and test it out yourself. 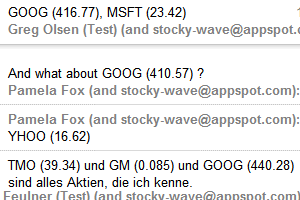 Stocky (stocky-wave@appspot.com) automatically detects stock symbols from a wave and updates it with the live stock price. Emoticony is a must have for all MSN fans. It’s a robot that converts text representations of emoticons to actual images once the Wave is submitted. The robot sits on this email address: emoticonbot@appspot.com and can be used in every conversation. Add this email address to your contact list: amazon-withwaves-com@appspot.com, then follow the commands instruction to use the amazon bot. Calcbot helps you with simple math calculations during your conversation. Add this bot to your user list: calcbot@appspot.com and follow the simple command to start. As the name suggest it’s a bot related to last.fm and music. Add Lasty (last-robot@appspot.com) if you want to tell people what you listened to recently on Last.fm during a conversation. After adding Lasty-bot to your contact list, type ‘YourLastFMUser-is-listening‘ inside a Wave and Lasty will tell what song are you listening. Completey (wave-complete@appspot.com) replaces “?? ?” in a blip with a suggested word. Similar to Emoticony but the other user gets notified along with a sound. Pretty simple and effective. Let the other users know how you feeling currently. Add rowoffour@appspot.com to your contact list and play against a robot, with the goal to get four cells in a row of your color before the robot does. This wave looks for #hashtags in your wave/blips, and uses the API at http://tagdef.com to look up definitions for these tags. It then adds a reply to the wave with the definitions. Add tagdef@appspot.com to your contact list and follow the instructions. Let me know which Google wave robot / Gadget/ tool you liked the most? Is there any new gadget released and not present here? Do let me know.